Martin Turner plays Backstage at the Green Hotel Kinross on Friday 3rd May 2019 at 9.00pm for Mundell Music. Tickets £25. Buy Tickets HERE. 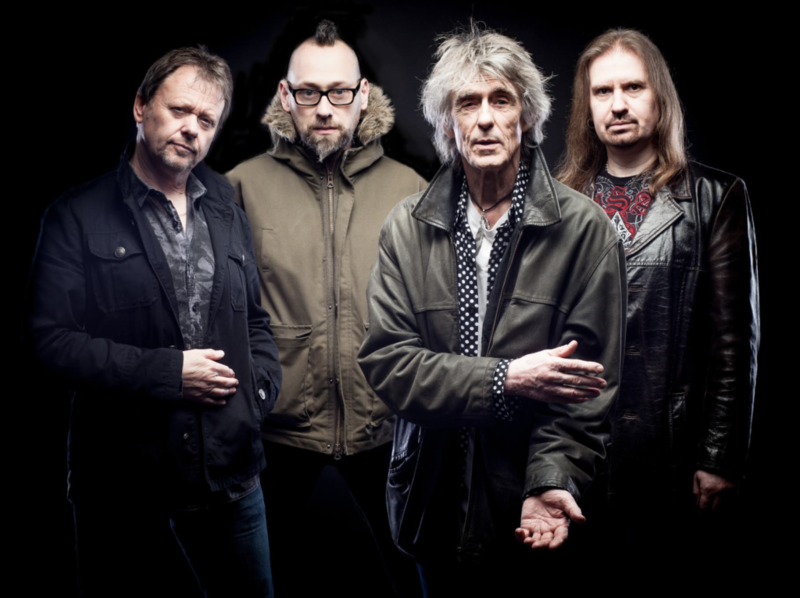 Fresh from 2017/18 shows which have featured Wishbone Ash’s seminal albumsArgus, There’s the Rub and Wishbone Ash in their entirety, Martin Turner and his band return to the concert stages in Spring 2019 to celebrate the 50th anniversary of the formation of the original Wishbone Ash and perform another classic album –1976’s New England. Wishbone Ash was formed by West Country musicians Martin Turner and Steve Upton, who arrived in London in 1969 to embark on their musical journey. Intent on creating a musical sound that was rich in texture and melody, Martin Turner envisaged the band’s innovative harmony-guitar hallmark and guitarists Ted Turner and Andy Powell were recruited via a now legendary Melody Maker advert. 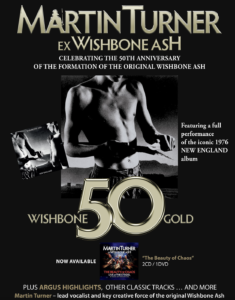 The partnership of the original line-up of Wishbone Ash forged a unique musical identity that would produce some of rock music’s best loved works and influencing numerous successful bands, resulting in millions of album sales and concert attendances. Wishbone Ash would become one of the most enduring British rock acts – its name synonymous with high quality guitar-driven melodic rock music. Five decades later, the music of the classic line-ups of Wishbone Ash continues to delight audiences worldwide through both live performances and a rich legacy of recorded work that continues to be enjoyed by fans old and new. Classic album releases such as Wishbone Ash, Argus, Pilgrimage, There’s the Rub, New Englandand Live Dates defined the Wishbone Ash sound and have touched the hearts of several generations of music fans. As lead vocalist and key creative force, founding original member Martin Turner was central to the critical and commercial successof Wishbone Ash’s most revered albums, with his passionate vocal delivery, songwriting ability, keen melodic sense and production values being major ingredients in the definitive Wishbone Ash sound. Martin Turner continues toperform the band’s best loved works with his current line-up, which features guitarists Danny Willson and Misha Nikolic, and drummer Tim Brown. In recent years Martin Turner has delighted audiences worldwide with his performances of material from the classic periods of Wishbone Ash’s history. 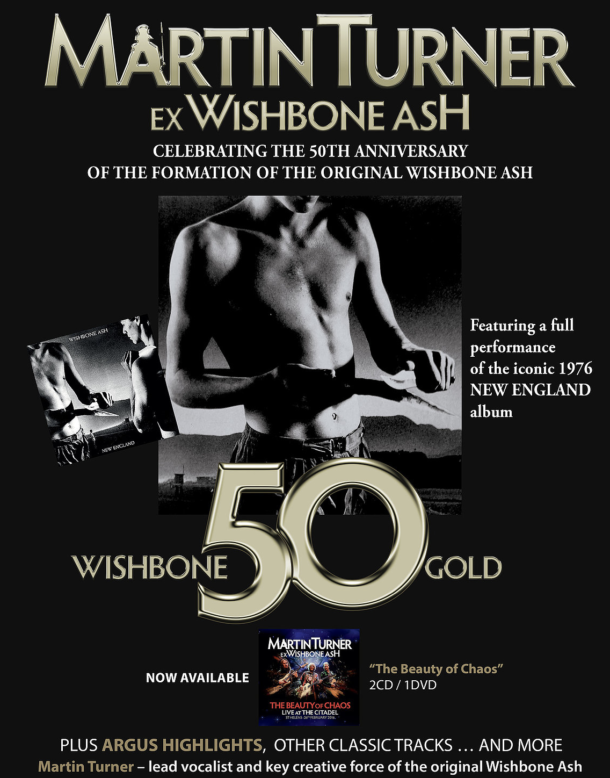 Martin’s 2019 touring continues his exploration of the Wishbone Ash catalogue and follows the release of a deluxe 30-disc Wishbone Ash career retrospective CD boxed-set entitled The Vintage Years 1970-1991 as well as Martin Turner’s 2016- recorded 2CD/DVD package The Beauty Of Chaos – Live at the Citadel. Released in October 1976 and featuring the celebrated Wishbone Ash “Mark 2” line- up of Martin Turner, Steve Upton, Andy Powell and guitarist Laurie Wisefield (who had joined Wishbone Ash in 1974 replacing original member Ted Turner), New England marked a return to form for Wishbone Ash after the relatively disappointing response to its predecessor Locked In. Recorded using mobile equipment, New England was written and recorded in the loose environment of a basement rehearsal facility set up at Martin Turner’s Connecticut home, resulting in an album that was brimming with live energy. With a mix of powerful rock numberssuch as “Runaway” and “Mother of Pearl”, alongside melodic cuts like “Lorelei” and“You Rescue Me”, the album was an instant crowd-pleaser. The band’s twin-guitarhallmark had never sounded so vibrant as on the album’s instrumental showcase“Outward Bound” and New England highlighted all that was great about this much- loved band.